We match every movement with a stretch. 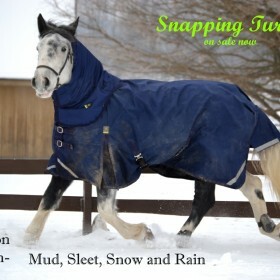 The TurtleNeck® concept was developed to provide a more comfortable fitting for the many unique shapes of horses. 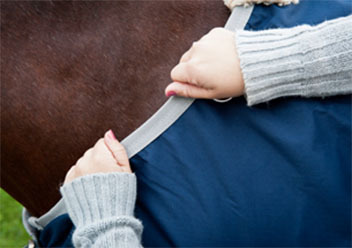 Our elastic neckline conforms to the shape of the horse and comfortably snugs up to keep the blanket from shifting. 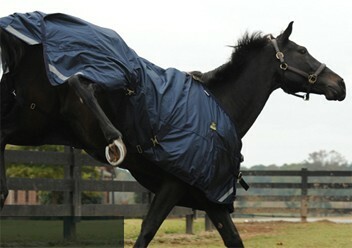 Once it is secured it stays in position while stretching in and out as the horse moves. The elastic belly and rear leg straps perform the same way. 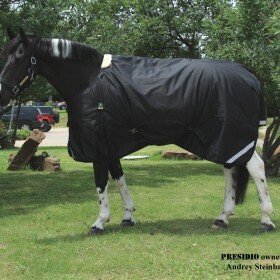 They secure the blanket then move with your horse in every direction. We take great pride in providing a very high quality product and professional customer service. Our unique patented stretchable neckline provides a level of comfort and protection that is unsurpassed. Every time your horse moves it stretches. The safety and protection of your horse is our highest priority. All of our turnouts have elastic belly and rear straps plus an anti-fungal lining. 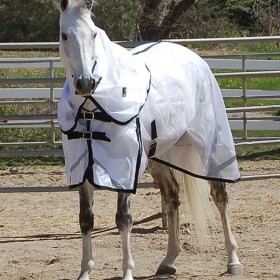 All of our blankets and sheets are made with durable outer fabrics both waterproof and breathable. They have a Teflon® coating on the outside of the fabric. Our design people have owned and ridden horses for many years. Their experiences have helped us design products that are more convenient for owners. Using the highest quality elastic in the neckline allows it to snug up comfortably when your horse is still, yet moves freely when he is in motion. 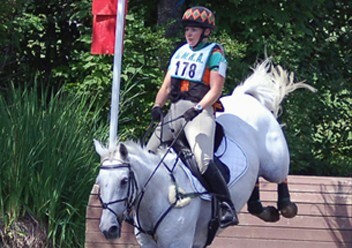 Daryl Kinney is a rider on fire competing throughout the Northeast and Canadian Eventing circuits this summer. Fitting Instructions, Washing Instructions, and temperature guidelines found here. Check out what our customers are saying about TurtleNeck.